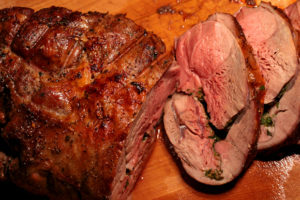 Preheat oven according to the cut of beef or lamb you are roasting (use guide below). Also determine the weight of the roast. Cook for calculated time, basting occasionally. Remove from oven when cooked to desired degree. Transfer to a plate, cover loosely with foil and rest for 10-20 minutes before carving across the grain. How do I know when the roast is ready? Either use a meat thermometer, or pierce meat with a fine skewer – clearer juices indicate the roast is more well done. NOTE: A larger piece of meat requires fewer minutes per 500g than a smaller cut. Roasts with bone-in cook more quickly than boned and rolled roasts. If possible, take meat from refrigerator about 30 minutes before cooking. For optimum tenderness, carve across the grain. For very lean cuts, sear or brown first. This will improve flavour, particularly when using small, very lean cuts that only need cooking for a short amount of time. Using a meat rack will allow even heat circulation and browning. After cooking, allow meat to rest for approximately 5 minutes per 500g. This enables the temperature to even out the meat fibres to relax and reabsorb some of the juices. BEEF: bolar, chuck, rolled rib, rib-eye, prime rib, fillet, rump, sirloin, thick flank, topside, spare ribs, wing rib, fillet, rump eye, centre rump, rump cap, rib-eye (scotch), sirloin, standing rib.